Hello Couchers! Welcome to the December 21st edition of Tuesday Couch Potatoes where we post about a movie each week. In a few days, we will all be celebrating Christmas. Wherever we are in the world, Christmas will always be a part of our family lives and I know you all are excited for this week's theme: A Family Christmas. 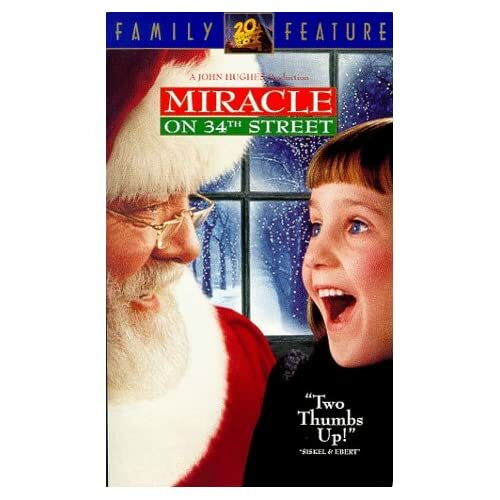 My pick for this week will be the 1994 remake of the film, Miracle on 34th Street. I saw this movie way back in high school and what can I say, this movie is unforgettable for me. Although this is the 4th remake of the original 1947 version, many reviews said that it stuck close to the original story but offers more contemporary, crisper pacing and a tone curiously more reflective--even sorrowful--than before. The original version featured and used the name Macy's department store but because it didn't want anything to do with the 1994 movie, they used the fictitious name Cole's. I find the characters very endearing in their roles and one of the scenes that I find so sweet and touching was when Santa was visiting with a deaf little girl and he used sign language. The look on the girl's face as it lit up is just one of the things that you need to look out for in the movie. If you are looking for Christmas family movies, be sure to include this one in your list. It will definitely be worth it! Thank you all for joining us this week on Tuesday Couch Potatoes. We hope to see you all again next Tuesday, December 28th, for the theme: A New Year's Eve Movie. Here's wishing everyone A Wonderful and Happy Holidays! it looks like a good film. I would like to watch it with my kids this Christmas. Dropping by for TCP.